Go to Life by Chocolate for a big sale on many of our chocolates. Sale will only last for two weeks. Yes Virgina, there is a Santa Buzz! Congratulations! You are the winner of the Foodbuzz Tell a Friend Weekly Raffle for the week of December 15-21, 2008. Your prize? Cuisinart Cordless Immersion Blender! We hope you enjoy your new kitchen gadget. Please provide for me your mailing information so we can send you your new Cuisinart Cordless Immersion Blender. Thanks for playing and keep on buzzing! And the odd bit is this is the FIRST week I started telling my friends. I sent one out to Daniel at Denman Island Chocolate and also to Sassy at VeganCoach.com Wow. I am so happy. I didn’t even know I was playing. I really needed one of these puppies. Thank you Dorian and thank you Foodbuzz. We finally had a nice picturesque snow! We got about 8 inches on Friday and another 8 inches on Sunday. 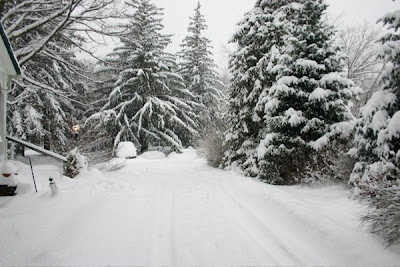 It was wonderfully fluffy and light – which is great when you are clearing walkways with a shovel! I took these pictures on Sunday. 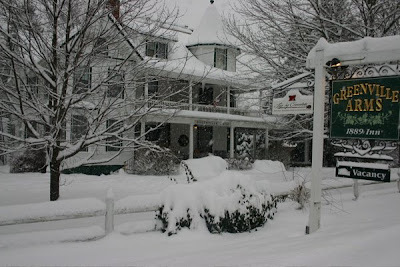 It was so quiet as I walked across the street to take the pictures of the front of the inn. Every noise was hushed by the snow. 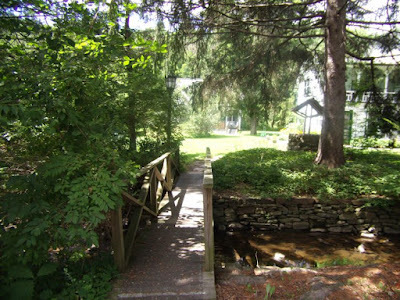 The shot below is looking towards the carriage house from driveway by the main inn. 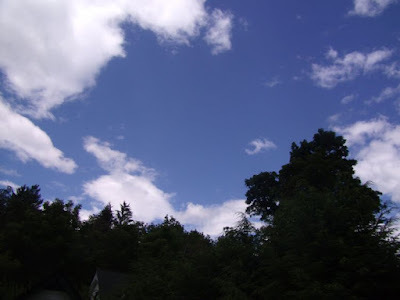 The lighting is still gray and overcast in these photos, but as I was out clearing the walkways around the carriage house (yet again) on Sunday, the clouds suddenly parted to reveal a brilliant blue sky. It was absolutely stunning. I had to pause and just drink in the sight. I quickly finished the clearing and ran in to get my camera to try to capture this awesome sight, but just at that moment some inn guests arrived and by the time that they were checked in and everything squared away, the blue sky was dimming. Sigh. I’ll have to try to catch it again some other time. Obviously I’m way behind on blog posts because Larkin Van Horn was here in November! 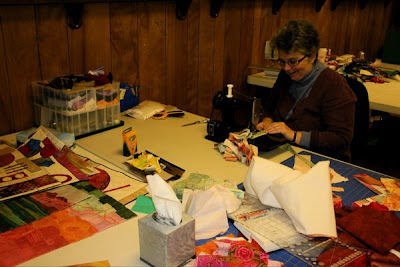 It was great to finally have Larkin here to teach her Fiber Embellishment workshop for us. 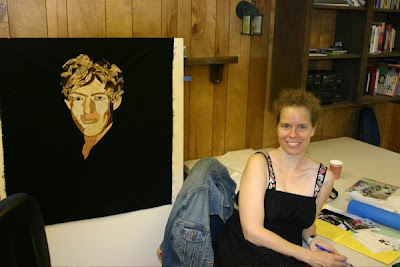 Mark had first met Larkin at the International Quilt Festival in Houston back in 2006 and after meeting her, Mark told me “you have to get her to teach a workshop for us!” So I did. 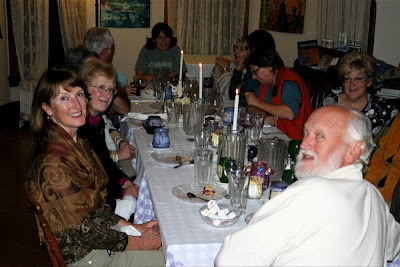 Here is the happy crew at the first night dinner. Already they are laughing together and having a ball. Isn’t it fabulous the way Larkin’s hair matches her shirt! 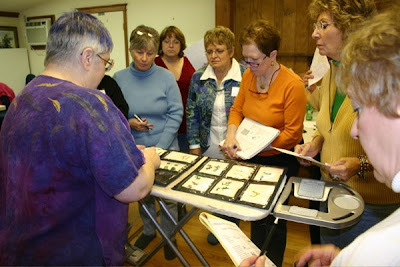 Here is Larkin showing the class samples of all of the different beading techniques that she will be teaching to them. Larkin was so organized! Great sample book! 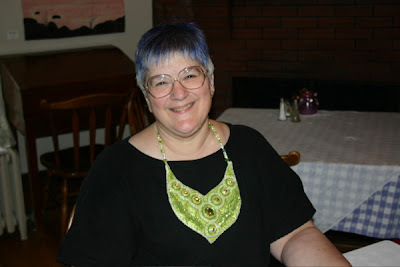 Larkin wore a different beaded necklace each day. Each one was incredible. I love bead work and this was my favorite necklace. Green is a great color. This photo doesn’t do it justice, of course. You really need to get close to see all the wonderful detail. 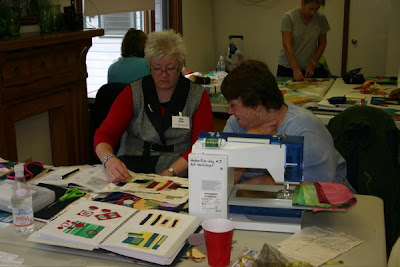 If you weren’t here you missed a great workshop, but you can make up for it by getting Larkin’s book, Beading on Fabric. It is a must-have reference book for anyone interested in adding beaded embellishments to fabric, where you are creating an art quilt or wearable art or jewelry. I’m sure it will just make you want to learn more, which is a good thing because Larkin will be back here teaching in summer of 2010. 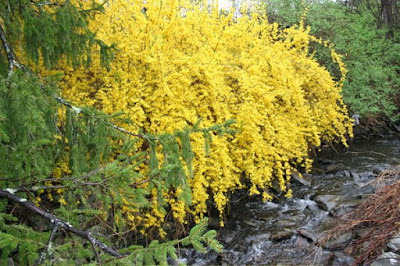 Such glorious greens and yellows! These are a series of photos the I took during the Robert Norieka workshop in early August and only just discovered that Mark had downloaded them on to our iMac and erased them from the camera before I could load them on my Mac laptop! Well, as least it is easy to transfer them over. So enjoy this look back at summer and a really fun workshop. 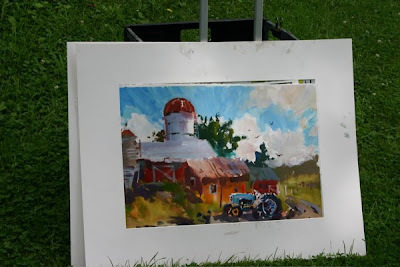 This is Robert’s demo at the Campbell Farm. Once more with feeling . . . 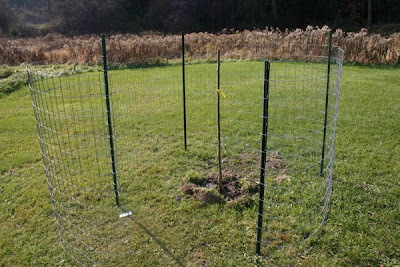 So this year’s tree is a Persian mulberry! 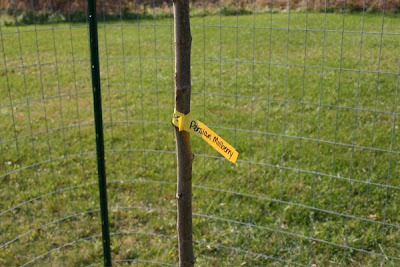 I’ve wanted to get a mulberry tree ever since seeing one for the first time at a farm in Gilroy, California. I had never seen “blackberries” on a tree, but grew up with loads of blackberries growing in our backyard. Nothing like fresh picked berries. Of course, a mulberry is not a blackberry, but they look very similar. Besides the fact that grass fed tastes better than corn fed. Besides the fact that I get free range beef at the arms. Besides the fact that all the calves are only 200-400 lbs when I get the meat. Besides all that, there are the reason in this article. So, next time I serve you beautiful, grass fed, free range local beef, enjoy it and know you are healthier. You’ve been eating it for most of this year. Enjoy. 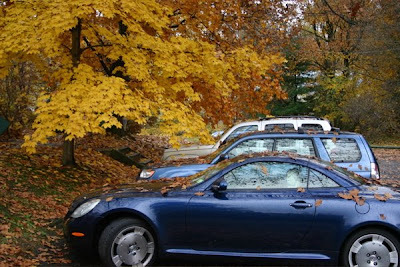 It is hard to believe that just last week the trees around the parking lot of the inn were still in full color. 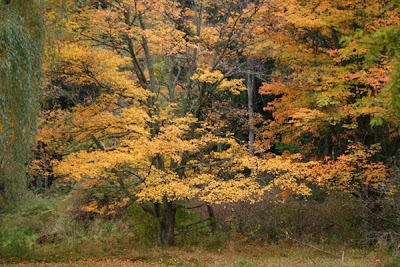 Now all of the leaves you see on the trees are on the ground — waiting for raking! 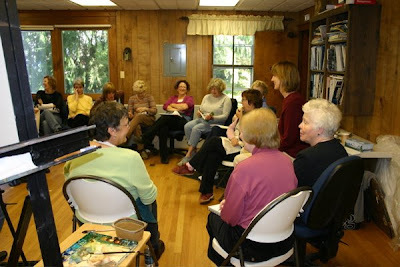 This is what it looked like while the annual Fall Retreat was in session. Just beautiful! 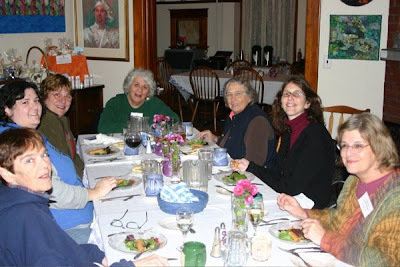 Here is the happy crew that took advantage of the Fall Retreat to enjoy the inn and the area while working in their favorite medium. Some came for the full 6-nights and some for just 3 or 4. Peggi has already signed up for next Fall! We can’t wait. 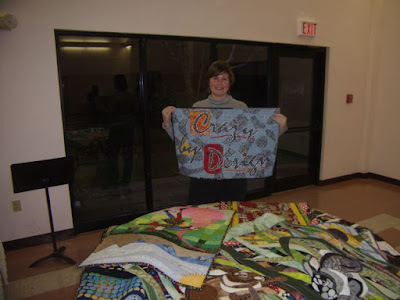 Liz Berg was here teaching her Abstract Quilt principles. 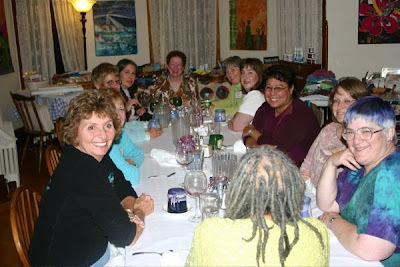 I first met Liz in California when she and I were in the same art quilt groups – first the Studio Art Quilt Association (there is a fund-raising auction of some incredible fiber art going on right now on the SAQA site), and then the California Fiber Artists. I knew then that she’d be a wonderful teacher, so I’m glad that I finally got her to come out East to teach a workshop for us. 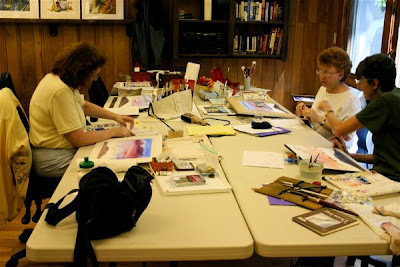 Liz put this hard working group through their paces as they studied the elements of design and created first compositions on paper and then in fabric. 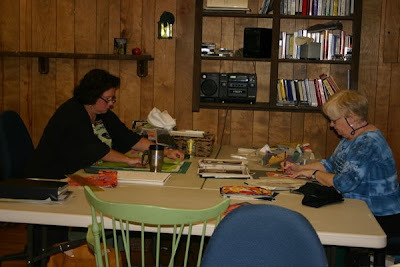 Here are Alison and Melinda totally focused on their work! 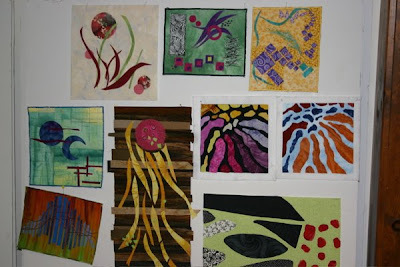 This is a shot of some of the students first work in fabric. Isn’t it fabulous! 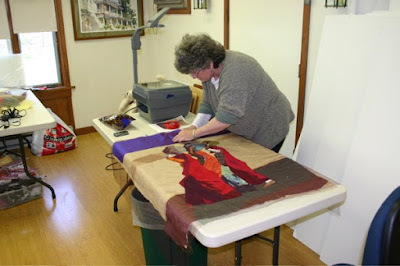 This is Susan Garfield-Wright strip piecing on her featherweight. 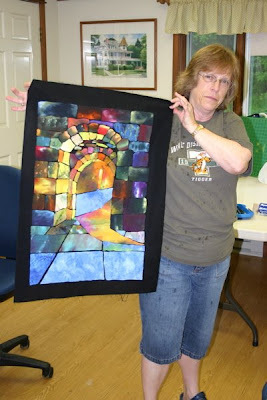 She created a wonderful composition using the fabric she created with the strips. A Nancy Crow alumni? I forgot to ask. 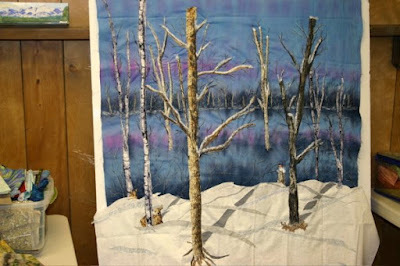 The colors of the trees in the front yard matched the fabric used in the studio! 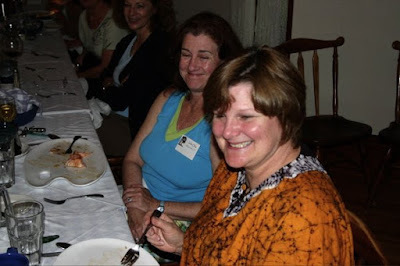 Here is Liz with Moira, who came all the way from Australia for both Liz’s class and also Carol Soderlund’s workshop (with a fun couple of weeks in NYC in between). 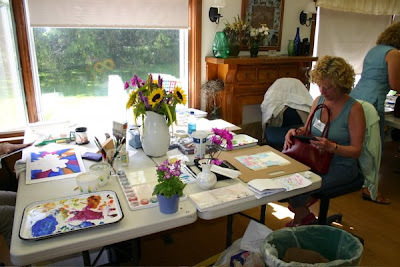 You can see on the table in the foreground the notebook/journal that Liz had everyone create from the handout, their own notes, sketches, and thumbnail compositions. What a fabulous idea and a great reference. 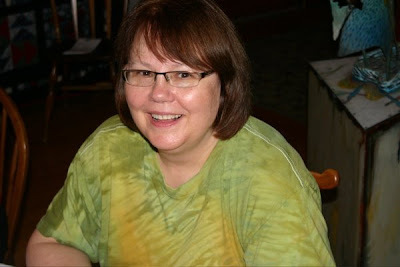 Here is Sheila from Canada. If you see her ask her the way to Woodstock! She and Liz arrived a day early and went on an unintentional tour of the Catskill Mountains on their way back from Woodstock to the inn. They had a grand time anyway! 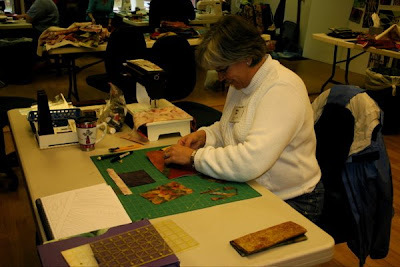 This weekend is our final 2008 workshop (Boohoo! And I mean that!). Larkin Van Horn is here teaching a plethora of beading and embellishment techniques. It’s only the first day and already everyone is creating such interesting designs. Larkin is the author of Beading on Fabric: Encyclopedia of Bead Stitch Techniques, published by Interweave Press. I’ll start take taking pictures tomorrow. Well, I wasn’t actually there fore her fabulous talk because she was too nervous having me in the audience. She was afraid I’d heckle her the way I do when we are showing the up and coming workshops. I would not do that to my sweetheart. This is the where. As in where’s Waldo? Who’s having a great time? Getting ready for the lecture. She’s ready. Isn’t that sweater beautiful? Kim made that. Just in case you didn’t know, Kim is head of Crazy by Design. 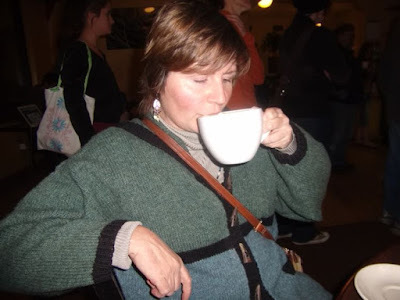 After her talk, we went over to a very rustic, very collegy coffee house for a very needed rest and recuperation. Actually, Kim had a fantastic time and was energized. 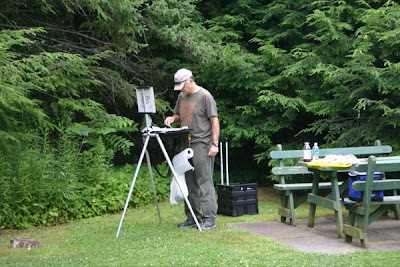 Kenn Backhaus, oil painter extraordinaire and just an all around great guy, was here teaching his outdoor oil painting workshop. 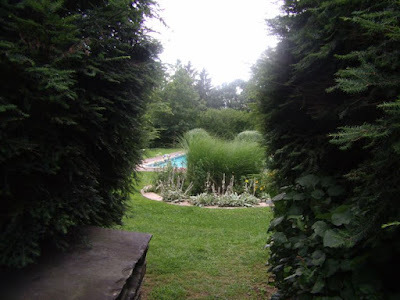 He took them to the Hollyhock Nature Preserve on one day, stayed around the inn on the one iffy weather day, and then spent 3 glorious days at Olana. The views from the upper part of Olana, where the house is was beautiful with all of the fall colors. Everyone also went on the house tour while they were there. 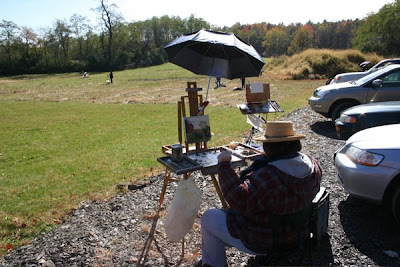 These follow photos were taken on the last day when the group paint down by the barns of Olana. Don’t you wish you had been here! 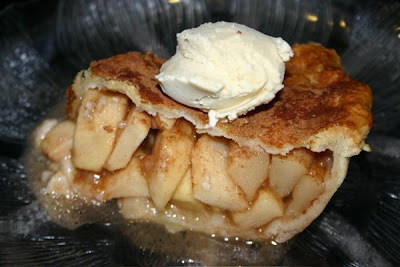 Here is a shot of one of the apple pies I was talking about. 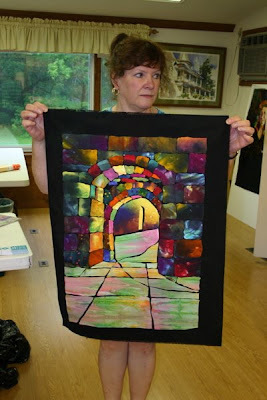 Carol Soderlund, master fabric dyer, taught a workshop for us for the first time this past October and hopefully it won’t be the last time! Everything that I’ve heard is true. 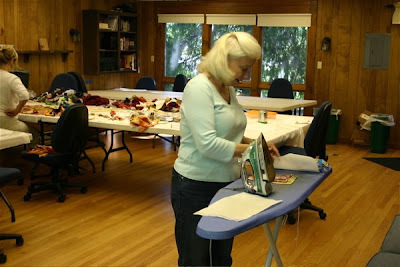 Carol is not only an expert at dying fabric, she is a wonderful instructor. She has broken down the steps for getting the exact color you want into a easy to follow process. I will definitely have to sign up for a class with Carol sometime myself! 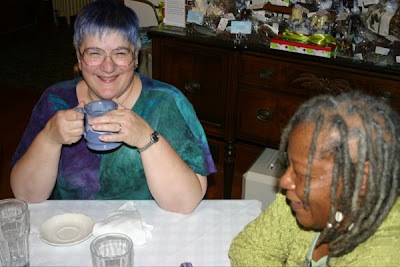 Here is Carol wearing one of her many hand-dyed shirts. 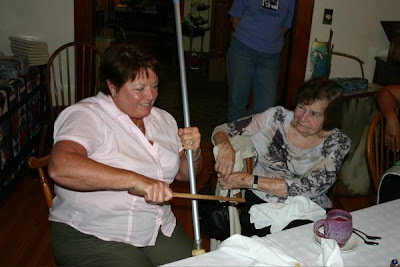 A couple of happy dyers! 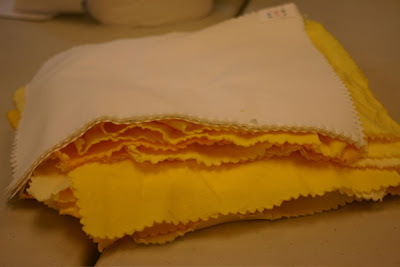 And a luscious stack of yellows. Everyone created such beautiful fabric. Don’t miss this class the next time around! And speaking of color, there’s a good reason that New York is called the Big Apple! 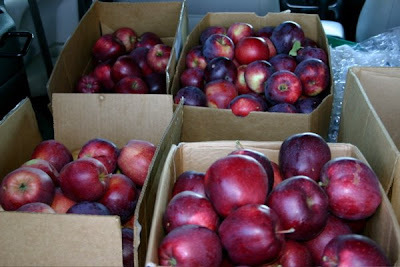 October is apple picking time and there are lots of pick-your-own orchards in the area. 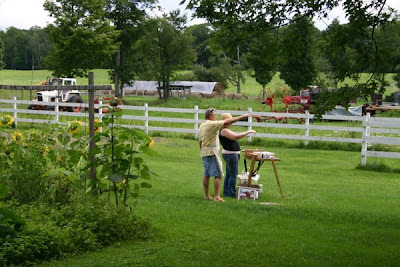 We were lucky enough to be invited to pick apples at an orchard belonging to an inn guest who stayed here this past summer. 800 trees and loaded with the most delicious Empire and Red Delicious apples. Mark has been making lots of apple pies for dessert. Yum! 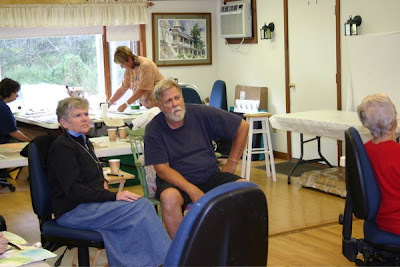 Yes, Skip Lawrence’s workshop was here before Mary Whyte’s workshop, but horrors of horrors, I didn’t get any pictures! My excuse is that Mark was freshly home after having rotator cuff surgery and needed extra attention — AND our dalmatian Hudson had bladder stones! I had to take him him to the emergency animal hospital twice in one day – one time at 1:00am. The good news is that finally Mark and Hudson are recovering nicely. Both are itching to get back to their regular activities. In any case, it is always wonderful to have Skip and Diane and the rest of the crew, both regulars and new students, here for their week at the start of Fall. We look forward to it every year. Next year I promise to take a ton of pictures. Mary Whyte also had a full workshop (next time I think we’ll keep the number down to 18 students! when you add 2 models into the room, it does get a little tight. 😉 and kept busy all day and into the evenings. 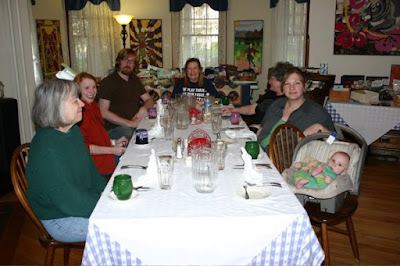 Here is the happy group at the dinner table. Mary is the first one on the left. The first day was spend on still life set ups. The second day on landscapes. On the third and four day, two models were brought in for portraits. 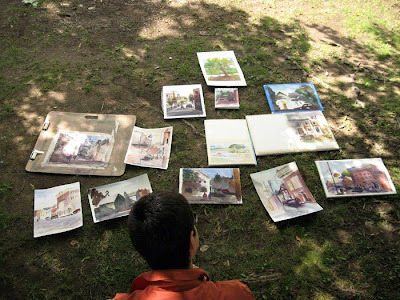 On the final day, students had their choice of subject matter. Mary also included general discussions on topics of interest to the students. 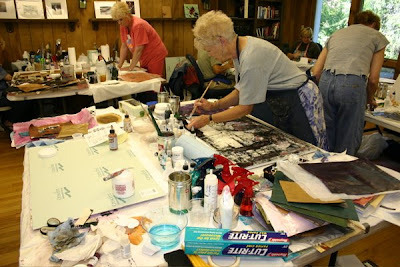 In this particular session, they discussed things such as how to get your art “out there” with postcards and other methods. It must be Fall because the mums are on the front porch. Stanley Maltzman brought a huge white mum plant (his annual tradition) and I put it center stage. I also finally potted the red and white dahlias and they looked great for about 2 days until they were hit with the first frost! Oh, well. I’ll have to dig them up and winter them in the garage. They were beautiful dahlias that I bought at one of the local nurseries, Mosswood Gardens, for Eric Weigardt’s workshop to paint. 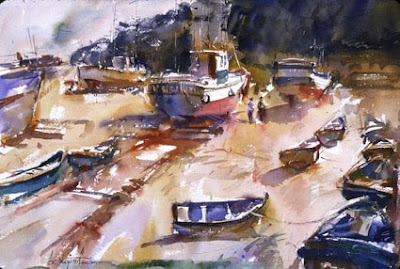 Following Pat Dews was John Salminen, who taught a fabulous watercolor workshop in which he took the students step-by-step from abstracts to realism. Kathy Salminen, an expert photographer, always comes with John and helps out in class with critiques and answering questions. That’s Kathy in the white shirt. 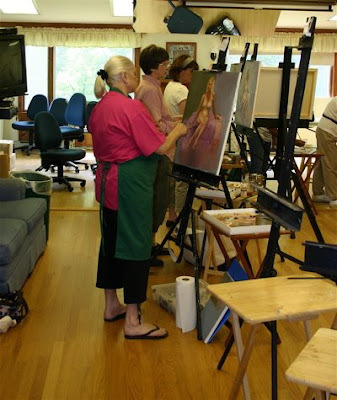 John and Kathy set up the studio so that each person could set their work on an easel at one end of the studio and then sit with John at the other end of the studio for a critique session whenever they needed. 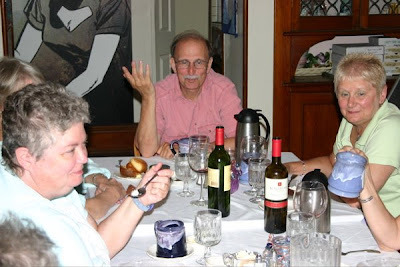 Here is Kathy help with a critique by pointing out the elements as John talks about them. 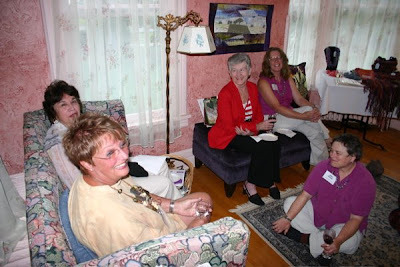 The group met each evening before dinner in our front parlor for a bit of beverage and lively conversation. John is an instructor who give 100% and then some to all the students in his workshops. Everyone was very happy with this workshop. 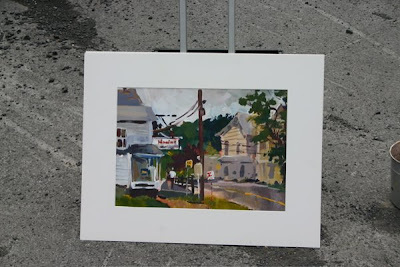 Kathy Salmenin takes a photograph of each student holding their abstract piece and creates a “class photo” sheet that she sends to everyone after the workshop – a great momento and reference! She also takes a class group photo and sends that to everyone, too. 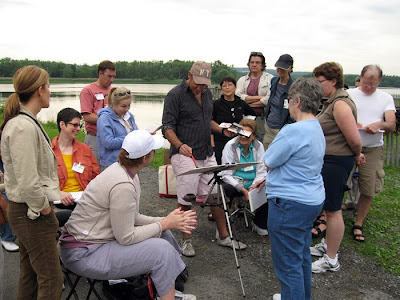 You’ll definitely want to sign up for John’s class the next time he teaches here, which will be May 16 – 22, 2010. Put it on your calendar now. On the same day that the John Salminen workshop checked out, I hopped on a plane and headed west for a mother-daughter vacation in Seattle and Whitefish, MT. 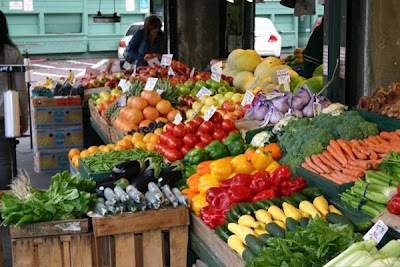 Our first stop was the Pike Street Market. What gorgeous colors! 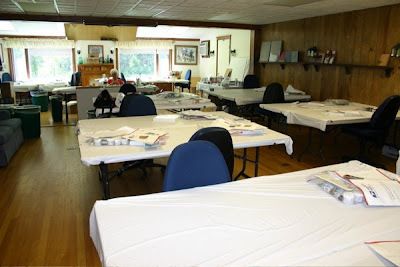 Back at the inn, as the workshop season winds down, we are preparing for the holiday chocolate season to begin. 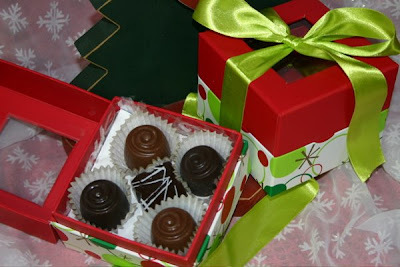 Check out this festive boxes and, of course, luscious chocolates. I know I’m way behind in the posts, but I’m finally finding a break in our busy schedule to start getting caught up. 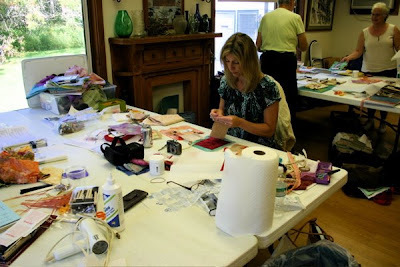 We’ll start with Pat Dews’ workshop that was back in September. 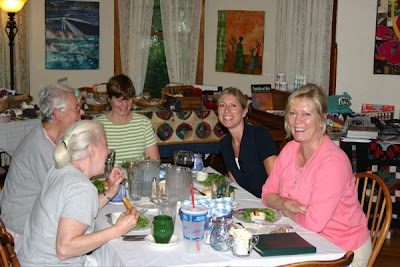 As usual, we loved having the non-stop energy of Pat and the students at the inn for the 6 nights. 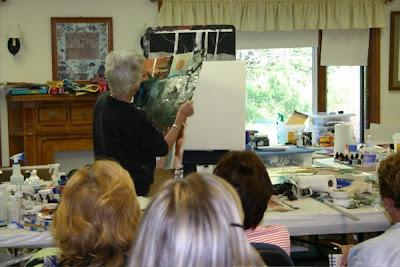 Here is Pat giving one of her many demos. 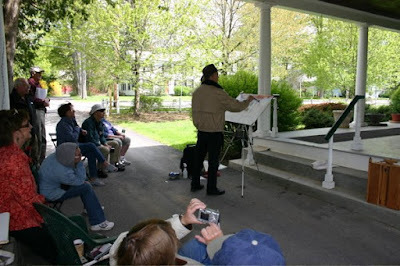 Everyone was amazed at the continuous amount of information and techniques that Pat demo’d. Look at all the wonderful stuff that the class worked with. 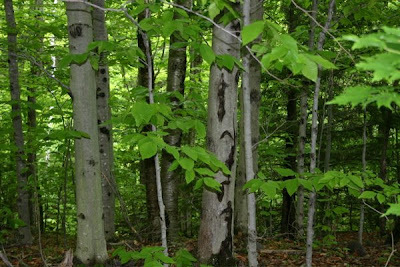 To bring you out of the past and into the present, here is a shot of the trees in our “back 40”. This was taken just last week. 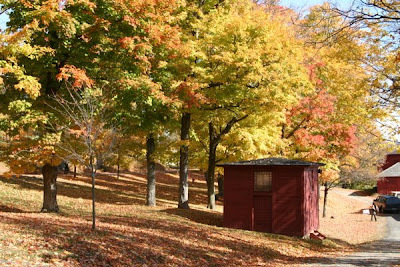 The trees around the inn are still in all their glory. 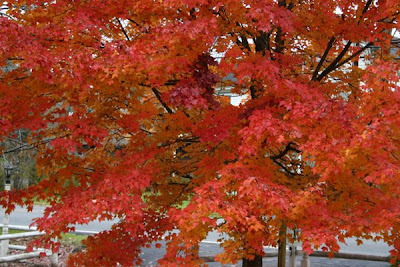 The maple trees in the front of the inn are just not starting to turn a bright red. The snow storm that hit this region last night totally missed our little corner of Greenville. When I went out at 7:00am with Hudson (our Dalmatian), the sun was out, the temps were already heading up to the 40s, and no snow in sight. I guess I have no excuse not to rake more leaves today! 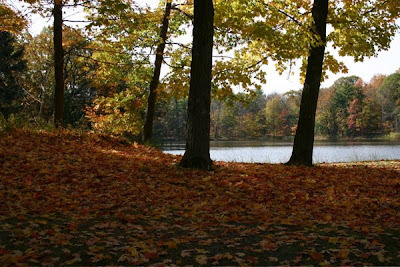 That’s ok, I love to rake leaves – a good thing since we have so many of them. I’m using them to line the pathways in our woods and when that is done I’ll start a monster compost pile near our future organic garden. 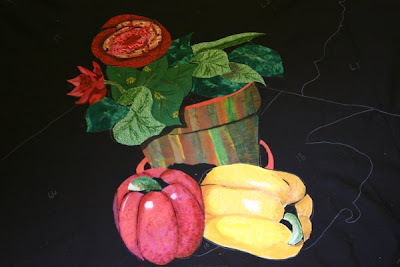 We are fortunate to once again have an exhibit of fiber art by the California Fiber Artists. The exhibit is in the Main Inn throughout the dining rooms and front parlor. 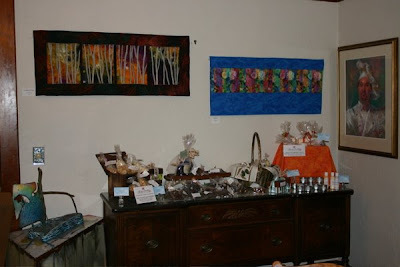 There is a variety of art from pieces for the wall, wearables, pillows, and cards. The exhibit will be up from now until December 31, 2008. 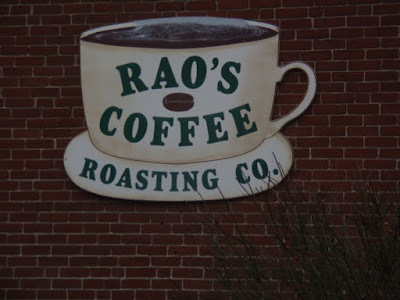 The general hours are Wednesday thru Sunday, from 10:00am to 5:00pm. 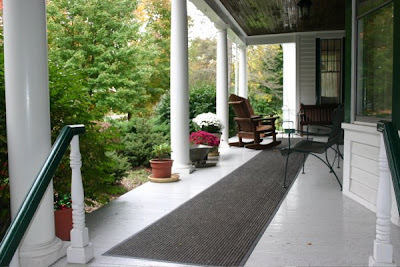 However, we are a inn that is open all the time, so give a call if you’d like to see it any other time. And for those of you who can’t make it, here is our online showing! All of the pieces are available for purchase. 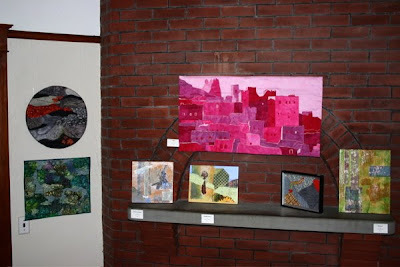 This view show another piece by Peig Fairbrook on the right. 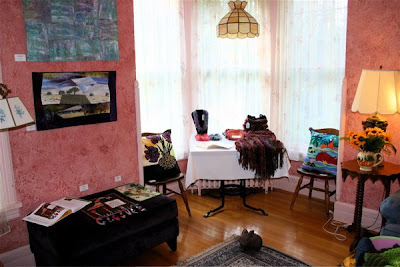 In this shot, you can see a piece by me (Kim LaPolla) and on the right of the rabbit is a piece by Sue Scott. Next we have a piece by Marjan Kluepfel on the left and one by Louise Schiele on the right. The large piece in the center of this photo is by Karen Rips. 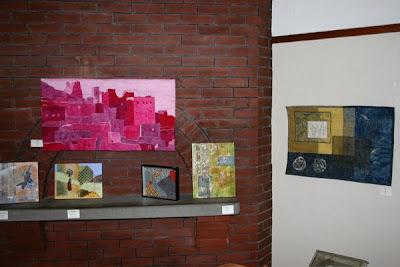 Then on the mantle are three collage pieces by Karen Flamme, plus on piece by Kim LaPolla. 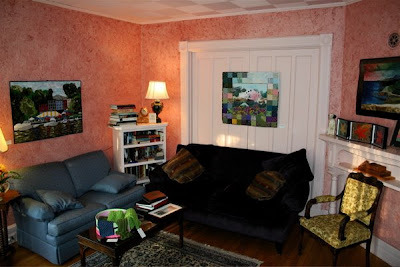 On the left wall are two pieces by Judy Martin. Another shot of the mantle, plus a piece by Sue Scott on the right. 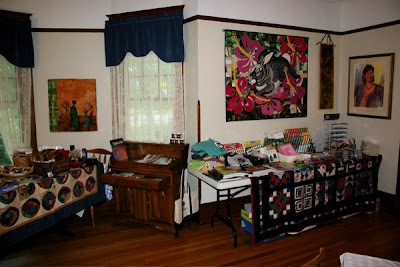 Now we move into the front parlor and see a piece by Karen Rips (highest) and below a piece by Lura Schwarz Smith (who will be teaching a workshop here next year). 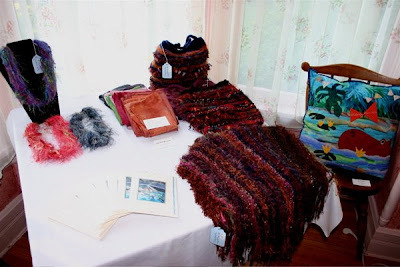 On the table are some wonderful fiber necklaces, knitted shawls, and felted purses by Judy Martin. 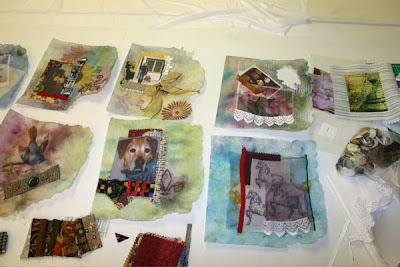 Also on the table are some cards featuring images of Vicki Johnson’s work. 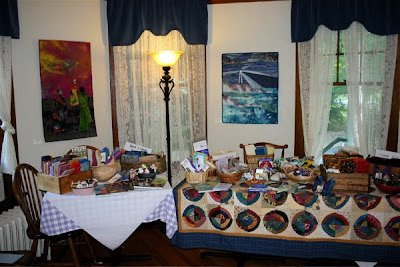 Next to the table on either side are some art pillows created by Terry Waldron. Also by Terry Waldron are the pieces on the purple ottoman. Here is a close up of the work on the table. 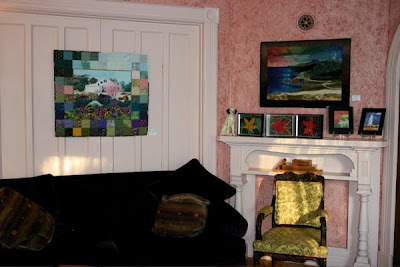 On the other side of the parlor is a piece by Kim LaPolla (on the left) and one by Vicki Johnson. 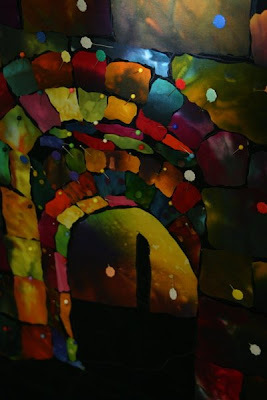 Here is another shot of Vicki Johnson’s work. Above the mantle is a piece by Marjan Kluepfel. 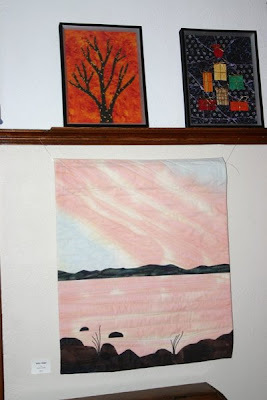 On the mantle are several digital mini quilts by Louise Schiele and several framed mini quilts by Kim LaPolla. I hope you enjoyed the online show, but please stop by if you have the chance because, of course, the work looks even more fantastic in person! 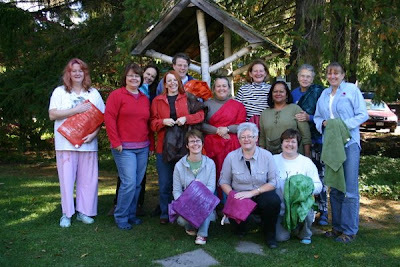 A small but very happy group just enjoyed a marvelous three days with Lesley Riley playing with Lutradur – the “wonder” fabric! 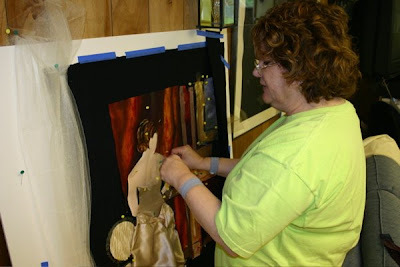 I call it the “wonder” fabric because Lesley showed us how to paint it, stamp it, use a heat gun to create a lacey affect, and cut the edges with a Creative Textile Tool. 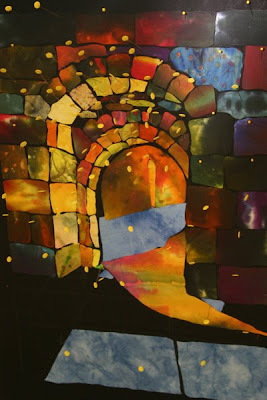 We also learned to transfer images onto the Lutradur using an acrylic gel medium with images printed on acetate sheets. More fun! 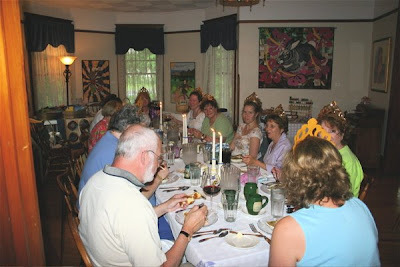 Here is the group at dinner. What a happy group! 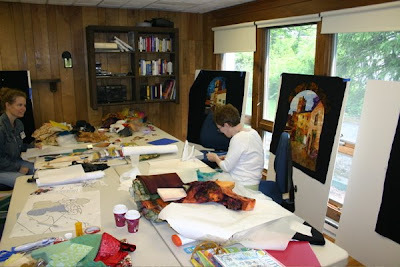 I was lucky enough to be able to participate in this class (on and off as the work schedule allowed!) and had a blast. This is the book in process that I created. 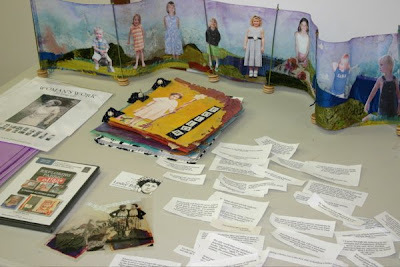 Here is the book in process by Susan Settle. 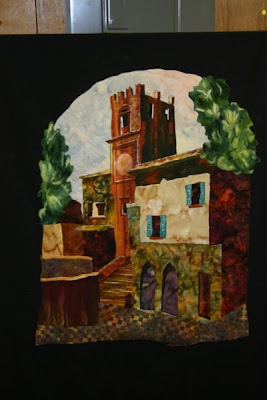 I just loved the rich brown color she achieved painting the Lutrador. 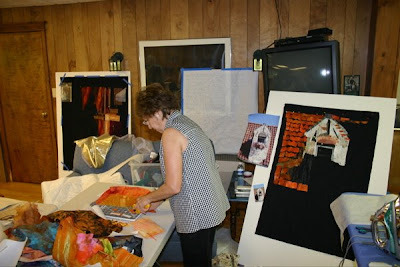 This is a shot of Lesley’s work and a selection of quotes printed on fabric that she provided for the class to use. More wonderful work. One of the benefits of the small class sized is that everyone really go to spread out their stuff all over the place! 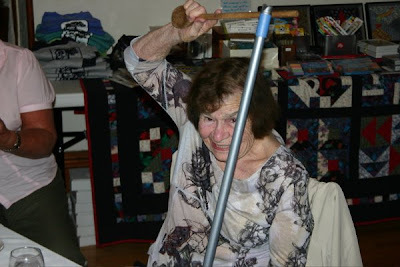 This is Julie Struthers at play! 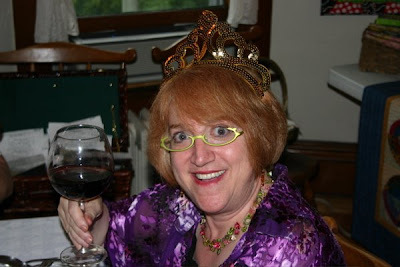 And finally, here is the Lutradur master herself, Lesley Riley. I know you must all feel miserable about missing such a fun class, but don’t worry. Lesley will be back again in 2010! I can’t wait. 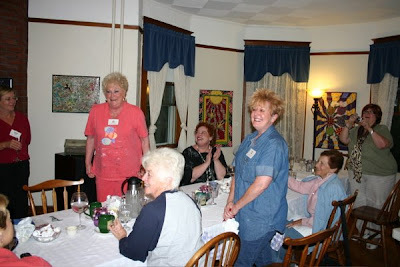 Tonight is the last night of the Mary Alice Braukman workshop. The week has gone by so quickly. 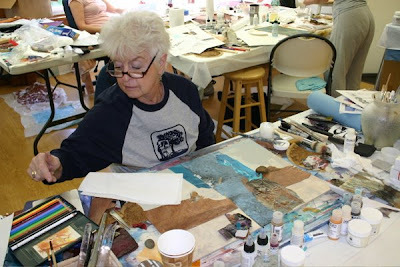 It seems like only yesterday when Mary Alice arrived a day early to sort through all of the supplies (paints, paper, mediums, and other goodies) that she had shipped here in advance for her workshop. 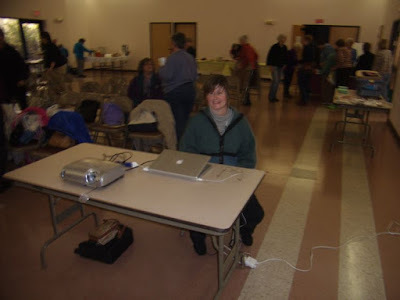 She created packets of supplies for each participant and arranged and covered all the tables with plastic. Look how neat and clean the studio looked at this point! 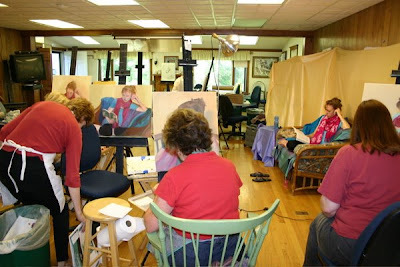 Then the students arrived on Sunday and by Monday morning the studio was looking well used. 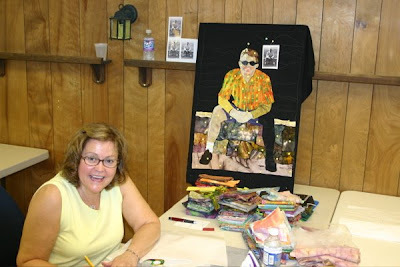 Here is Mary Alice, looking very fetching in our new Hudson River Valley Art Workshops Baseball T-shirt. With the weather getting a little cool in the evenings, everyone previously had been asking for a Tshirt with longer sleeves — so we got them! 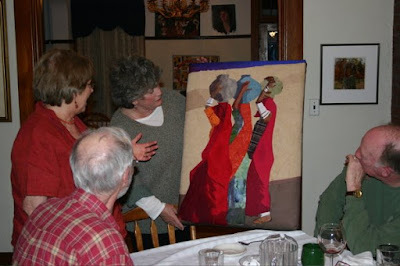 On Tuesday night the group celebrated Gay Billich and Carol Staub’s acceptance into the American Society of Collage Artists. Way to go Gay and Carol! 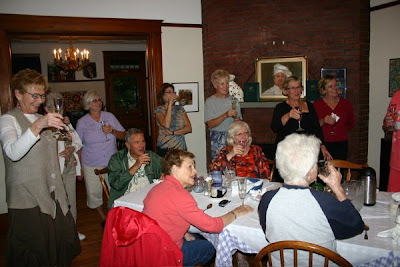 Jan Olmstead headed up the celebration by buy a round of sparkling wine for the whole group. That’s Gay in the pink and Carol in the blue. The weather was beautiful all week. It was a nice time to sit out by the pool and relax. There is Mark with his mom, Joyce, enjoying the late summer sun. 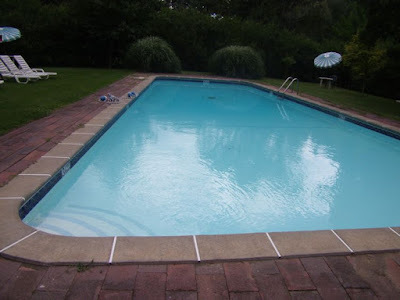 The pool is still open and will be until October 3rd. (Let’s hope we don’t get an early freeze!) I can’t vouch for the temperature of the water, but it sure looks inviting. So don’t wait too long! 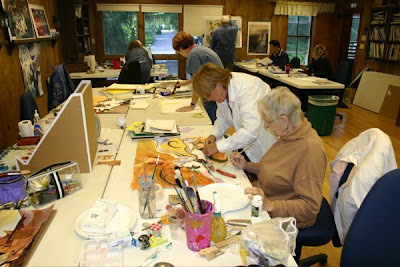 We still have space in the John Salminen and Kenn Backhaus workshops this year. 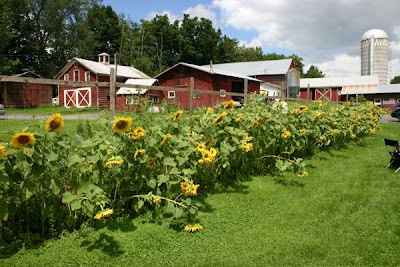 So come and enjoy the best time of the year in the Catskills. Everyone went home this morning and the inn is so quiet. The weather was so beautiful all week. 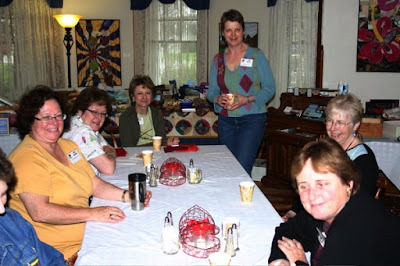 On Wednesday the group stayed around the inn. Mel started the day with a demo using a model (Tara, who also works in our kitchen). 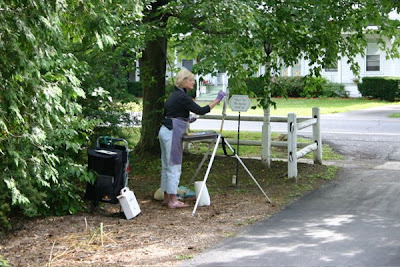 It was fascinating to watch the progression of the painting. I wish I had taken a photo of the finished demo. 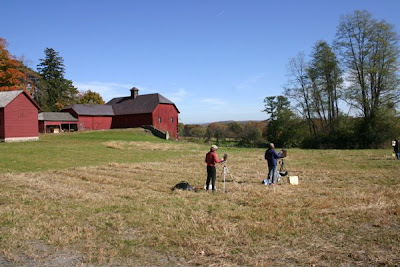 Thursday the group went out to paint at the Campbell Farm with a male model this time, posing as a farmhand. It was another gorgeous day, but thank goodness for the huge shade tree! The final day was spent around the inn again. 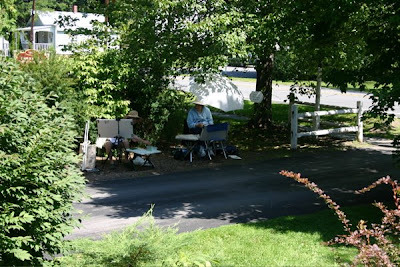 There are so many good subjects around here and plenty of shady spots to set up in. 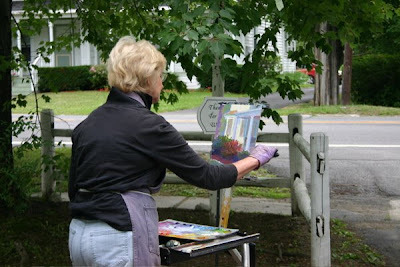 Here is Mel helping Christy on the inn front lawn. Gerry and Patti found a nice shady spot in our tulip bed! It was sad to see every one head home. This group had plenty of old friends that it was wonderful to see again and plenty of new friends who we hope to see again soon. 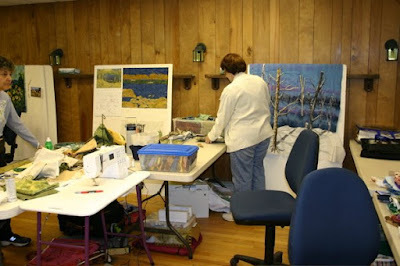 Mary Alice Braukman, the instructor for the workshop starting tomorrow, arrived today and is busy opening and setting up the dozen of boxes of supplies that she shipped here for her collage workshop. It’s going to be another full house. The other day I did my super creamy risotto. It’s a very simple, though time consuming recipe. Some years I’ve made this with artichoke hearts rather than saffron or you can make it with porcini mushrooms, any wild mushroom. If you use dried mushrooms, put them in at the beginning. I like to put them in the broth. If not dried, at the end. First saute onion in the pot with EVO. Next add the rice and continue sauteing. Add wine. Stir. While stirring, add, slowly add, the beef stock. You should probably add no more than 4 ounces at a time. Stir constantly. Wait for the beef stock to be absorbed. If the stock is puddling around the rice, keep stirring. When you run out of beef stock, around a 1/2 hour to 45 minutes later, and all the stock is absorbed. Put in butter, cheese and saffron. Cover and let stand 5 minutes. Stir the melted cheese in and serve. This should not be dry but rather very creamy. For the dish in the picture, I added lots of cheese so it is extra creamy. Very wet. 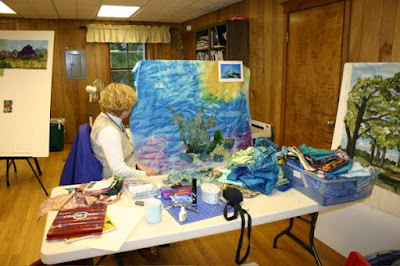 I finally finished the update to the Fiber Art/ Quilt Art workshops website and now all of the 2009 workshops are listed there, as well as the remaining ones for 2008. The brochure is at the printers and it won’t be long before we will be sending them out to everyone on our mailing list. I can’t believe how this year has flown by. 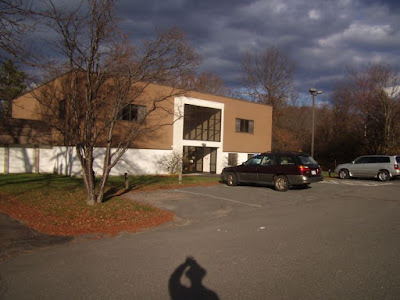 Mark is away this week on a chocolate business trip, marketing our chocolates to stores in Vermont and New Hampshire. 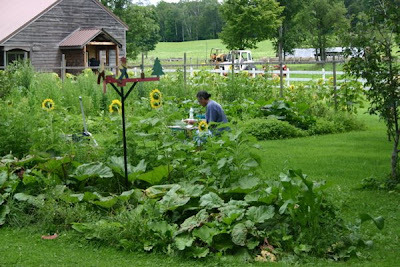 He has already signed up 2 shops in Vermont and the week has just begun. I’m sure he will be posting about his adventures on the Life By Chocolate blog as soon as he gets back. 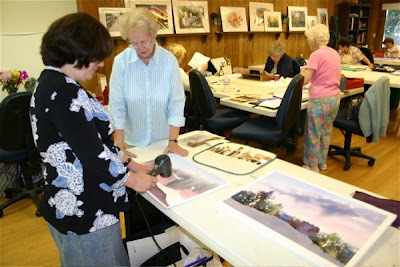 Jean Uhl Spicer was here this past weekend to teach her 3-day workshop on florals and landscapes in watercolor. 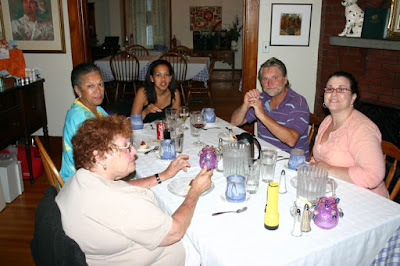 It is always such a pleasure to have Jean and her husband, Ron, here at the inn. 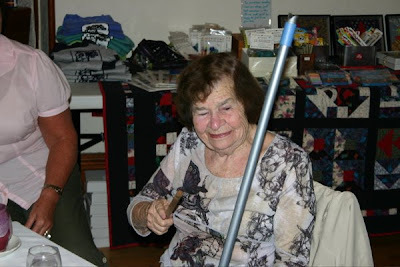 Everyone in the workshop had nothing but wonderful things to say about Jean as an artist AND a teacher. 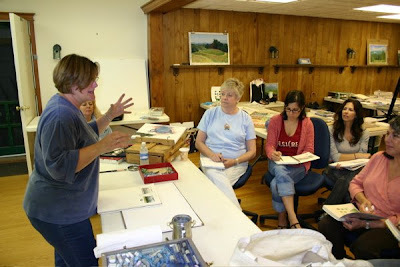 Here is the group during the first days critique session. 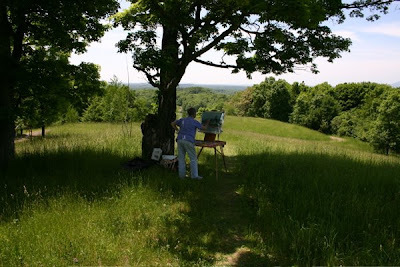 Here is Jean offering assistance to Eli on the last day when they were working on landscapes. This week Mel Stabin is in the house. We are happy to have him back after a 2 year absence. The first day Mel took the group back down the road from the inn to the old church that is in the process of being restored (still). 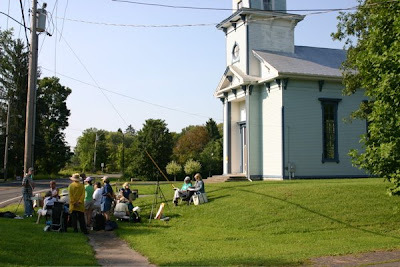 In 2005 I was able to take a great photograph of Mel in front of the church giving his demo and I was hoping to get a repeat photograph this year — because the look of the church as changed since that first photo. 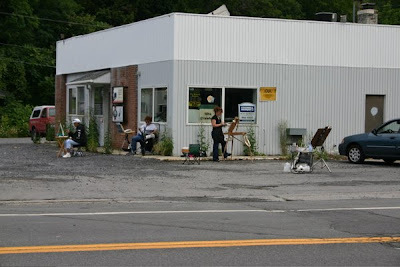 But instead Mel decided to paint the buildings across the street from the church. It was a good thing that most everyone brought their sun hats. For a day that was suppose to be rainy with thunderstorms (those waited until dark), it was instead a beautiful summer day. Our fresh brewed minted ice tea was popular that day! Tomorrow and the next day the class with be working with a model in the landscape. I’ll be sure to take some more pics. Where else can you get entertainment like this . . . ! 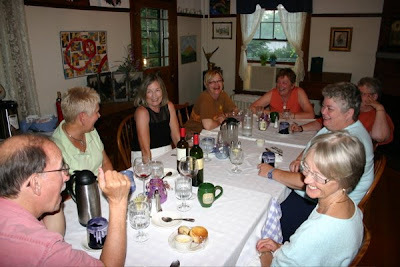 It was the last night of the Lewis B Lehrman workshop and happy diners were relaxing after their delicious meal of sweet pepper risotto, goat cheese and herb stuffed chicken, and refreshing dessert of fresh fruit topped with greek yogert and local honey, when the conversation turned to music. Here is Debbie show us how it is done. 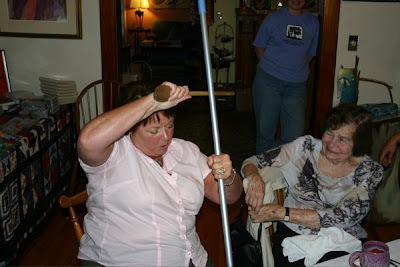 The technique required that you tap the broom in two spots on the front and then bringing the spoon over your head to tap once in the back of the broom. 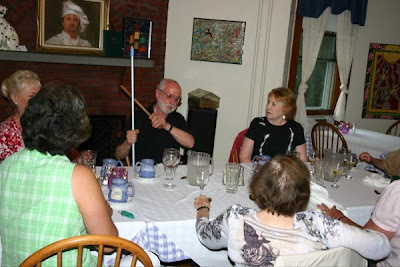 Then the broom was passed around the table and everyone got to have a go at it while everyone else sang along. Here is Lew showing his technique. I wish I could have a sketch of this! The last person to get a chance to show her musicality was Chestina. What a performance! She brought the house down. 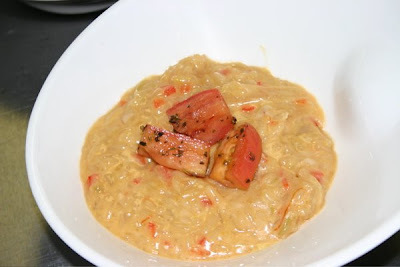 Here is a shot of the yummy and oh so creamy sweet red pepper risotto. I would have been satisfied with one big bowl of this for dinner! 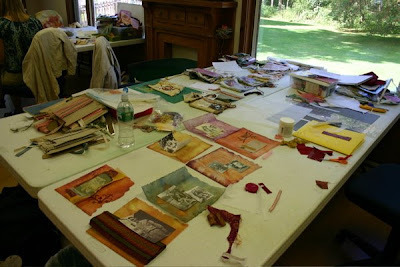 We have a small break between workshops today, but tomorrow Jean Uhl Spicer arrives for another wonderful workshop. 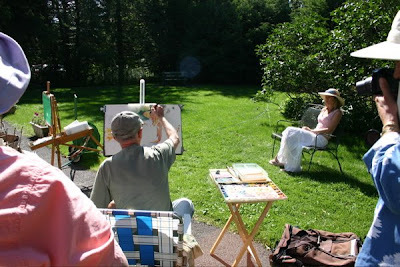 There are still a couple of space left in the class for you spur-of-the-moment painters! I know. I have not been blogging here. 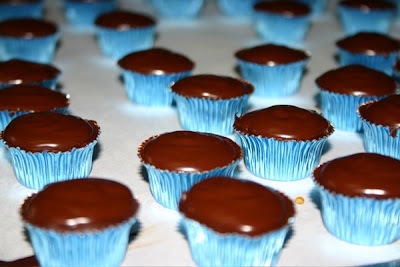 Check out Life by Chocolate Blog for all the recent recipes. You are missing such beautiful weather. Who needs Corfu when they have this? 🙂 Why aren’t you here at the Greenville Arms? Look at the clouds in the reflection. 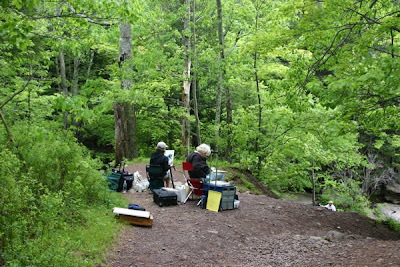 The Robert Noreika outdoor acrylics workshop started today, and while the group may be small, already they are having loads of fun! 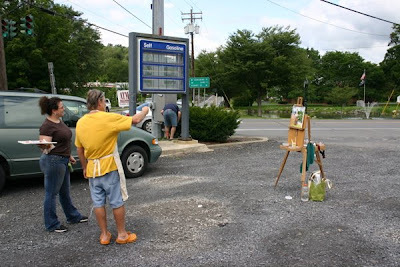 Oh, the “scenic” painting sites! 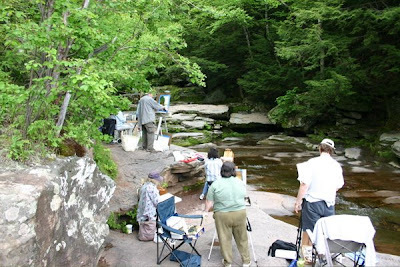 We’re right in the middle of the beautiful Hudson River/Catskill Mountain region and where does the group go to paint . . . Perhaps it was the closeness to Tommy’s Matt Dogs. 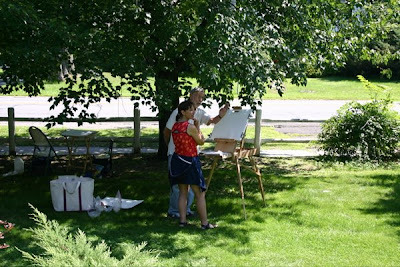 Here is Bob helping Piper with her painting. 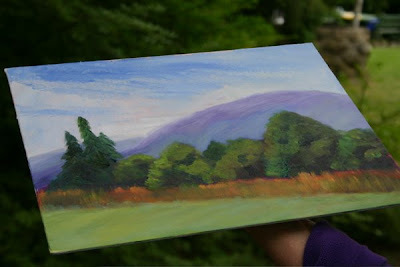 This is Bob’s demo painting that he did at the start of today’s session. 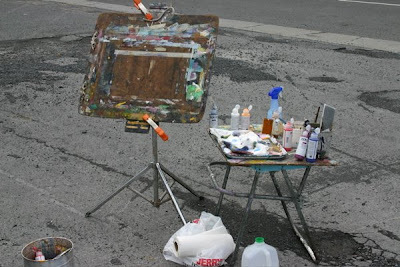 And this is Bob’s painting set up. 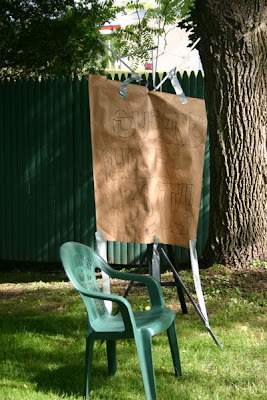 Don’t you just love the unorthodox ingenuity of the stand for his paints — a lawn chair with the back sawn off. 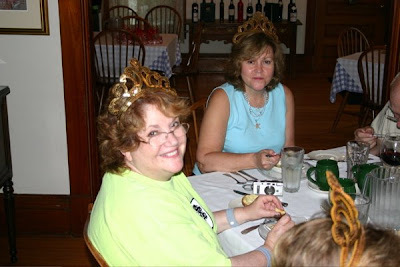 Here are Judith and Yvonne. They are painting the scene of the park across the street. Bob and Bobbi having a laugh! Mark says I haven’t been blogging enough about the food. 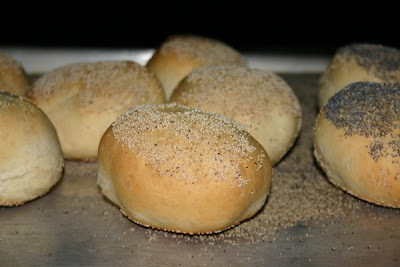 So here is a quick shot of one of my personal favorites — homemade Kaiser rolls. Yumm. They are especially good for dunking in the broth of my Ratatouille dish! But a good slab of butter is nice, too. And speaking of yummy, we now are serving greek-style yogert at breakfast time. I love this stuff with a good dollop of local honey. 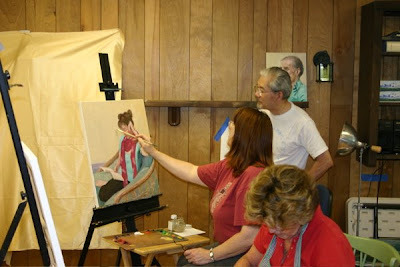 We just finished our back-to-back oil painting workshops with HongNian Zhang and Lois Woolley. 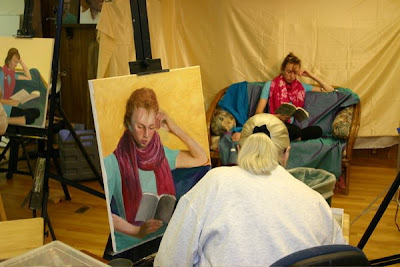 We had 5 students who took advantage of the back-to-back discount for these two workshops. HongNian’s workshop started with some still life set ups on the first day and then worked from a live model for then next two days. And now for a brief intermission featuring the lilting melody of some Irish Harp and Violin music performed by Fiona and Gillian Graham. 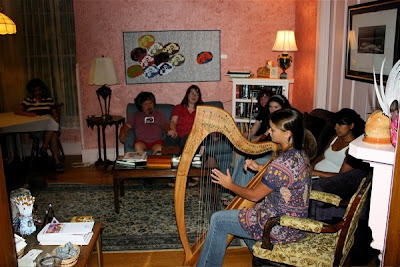 Fiona and Gillian were attending the Irish Music Festival classes while staying at the inn with their mom, Mary Graham, who was taking the workshop with HongNian. What a talented family! 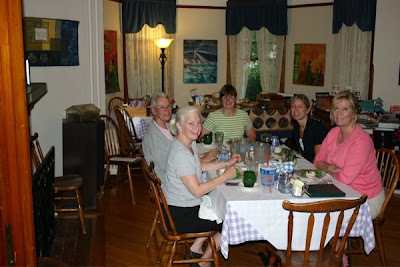 Immediately following HongNian’s workshop, Lois’ workshop started. 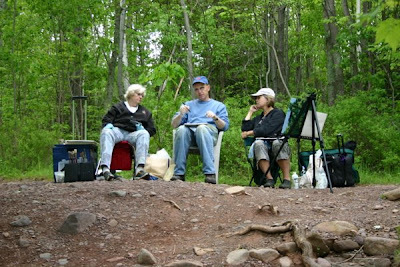 I didn’t have the chance to snap any photos, but Lois’ started the class out working on a clay model of a person’s head. 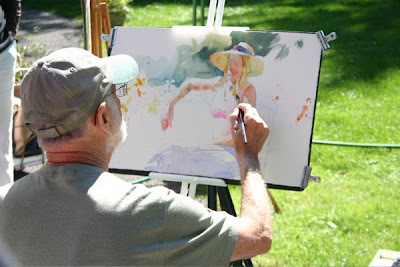 The purpose of which was to really get a hands on feel for the anatomy of a human head — to get a better understanding of the angles and planes used in a portrait. What a unique idea! 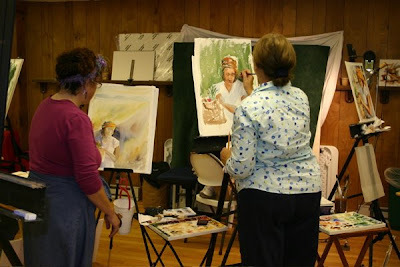 The remaining 4 days of the workshop were spent working with live models. 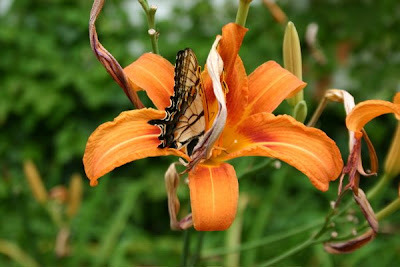 The lillies are blooming all over the property and everyone is enjoying the lovely scent, including this butterfly. We get thousands of junk emails an hour. I personally delete about 100 every 10 mins. So, if you are worried that an email you sent us was over looked, please put Workshop in your subject line to get it to our attention. 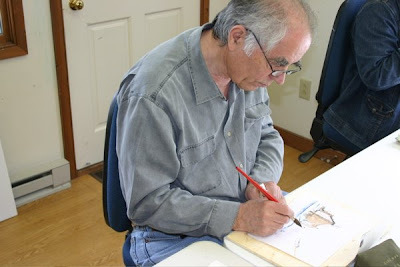 Charles Van Horn has answered my plea and has provided us with some fabulous pictures from Alvaro Castagnet’s workshop here this past June. Thank you Chuck! Don’t you wish you had been there? Well, Alvaro will be back again in 2010 – May 2 – 8 to be exact. 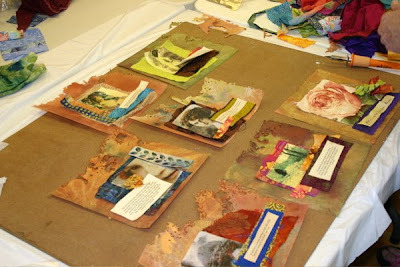 It has been brought to my attention that we may have somehow missed blogging about Esterita Austin’s workshop here last year! So making up for lost time, I’m blogging about it now and I have lots of great pictures. Make note of the fun time had by this group, because Esterita will be back teaching a workshop on still life and portraiture in fabric next year. 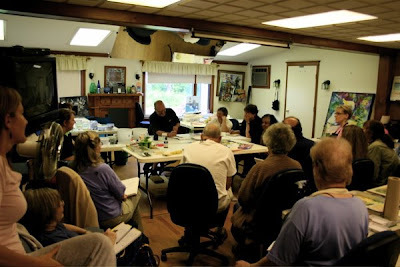 The dates for the workshop are March 29 – April 4, 2009. We are taking sign ups now, but the color brochure and the class information will be available sometime this Fall. So here is the Queen herself. And some of the royalty in the workshop. Now for some pics of the wonderful work produced by this class! Aren’t these fabulous? Some were created by total beginners! Hope you enjoyed the show. Don’t miss the production of the next! And now the the continuation of the story! As you know cellphone service can sometimes be iffy, depending on your phone and service plan, so a special “phone booth” was set up for Susan to make her calls. I don’t know who set it up but it seemed to work because I saw Susan sitting there with her cell at least once a day. In case the picture isn’t clear, this cell tower was constructed from one of our indoor painting easels, a light stand, and of course duct tape! The sign says “Susan’s Phone Booth.” Clever. 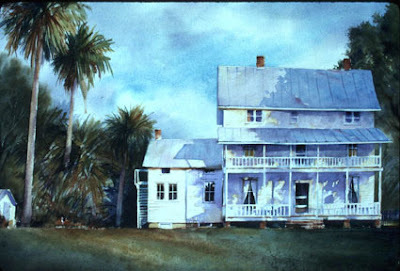 Here is one of the paintings by Ann Cox. I thought it turned out nicely. 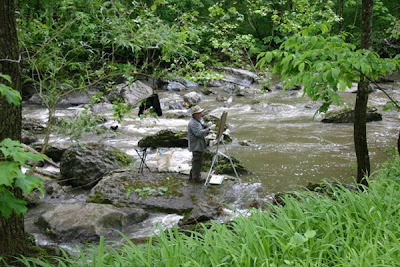 Tom L found a good spot to paint in the corner by the creek. 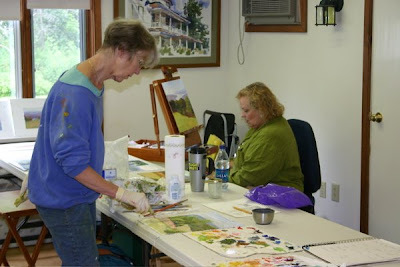 Here is Carole K and Sandra N painting in the nice air conditioned studio. 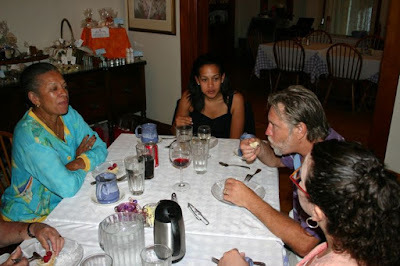 Mark had knee surgery on July 3rd, so while he recovered, I filled in as chef for a couple of the dinners. 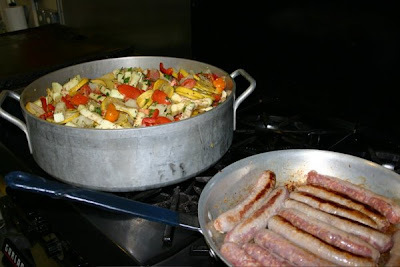 One of the dishes I made was Ratatouille with mild Italian sausage. This is one of my favorites and I’ve made it for years. It is the perfect summer dish because you can use all of the fresh summer vegetables: summer squash, zucchini, red and orange peppers, eggplant, plum tomatoes. It is seasoned with oregano, thyme, and basil. The vegetables roast in the oven first, then you add the browned sausage cut into chunks and roast until is it is a bubbling yummy mixture. I always like to make extra because it is even better the next day as leftovers! 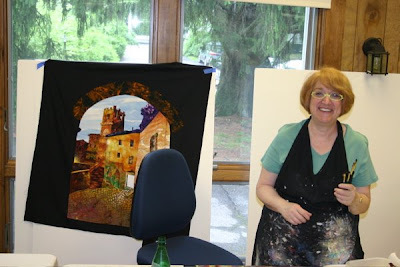 Susan Sarback, the founder of The School of Light and Color, in Fairfield, California was here last week teaching an outdoor workshop to an enthusiastic and fun loving group of artists. 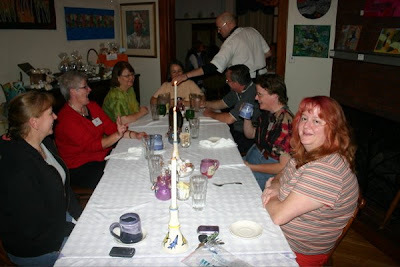 Everyone enjoyed the lively dinner time conversation. 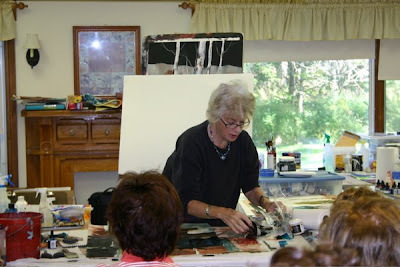 Here is Susan giving a demo in the studio. 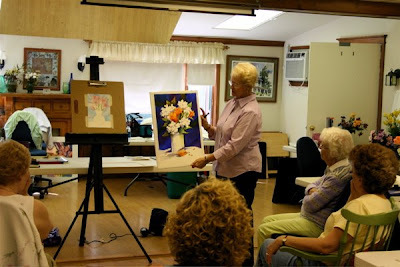 She started the class with still life in the studio on the first day. Well, Blogger is acting up again. So I’ll have to continue this post later with more pictures. The thing I like the most about it is that rather than the usual one or two images per artist, this book has multiple pages full of work by each of the 40 artists highlighted in this book. Being able to see this range of work really gives you a much more thorough glimpse into the artist’s voice. 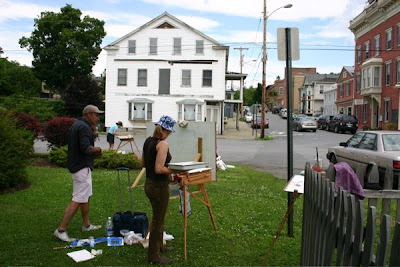 Each section includes insights from the artist. The insights touch upon their process or their inspirations. I enjoyed seeing the familiar and the new. 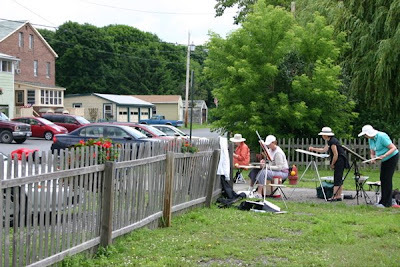 Many of the artists I already knew about (some I’ve taken workshops with or I have hired them to teach workshops for the Hudson River Valley Art Workshops), but there were also many artists who’s names I’d heard of, but have never before seen their work or some that I’d not heard of. It is a wonderful chronicle of some of the most talented artists working in fiber today. I hope that this chronicle continues in more volumes of this book. 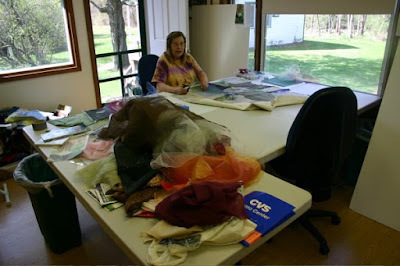 It would make an excellent encyclopedia of fiber art. I immediately decided to buy a duplicate of this book to put in the inn library because I didn’t want to let go of my personal copy! 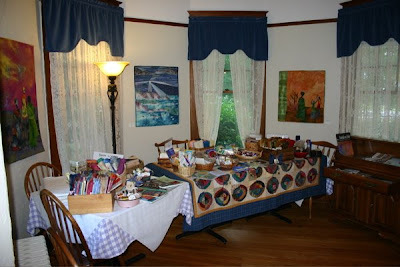 I’ll also be adding it to the stock of mini fiber art supply store at the inn. It is that good. 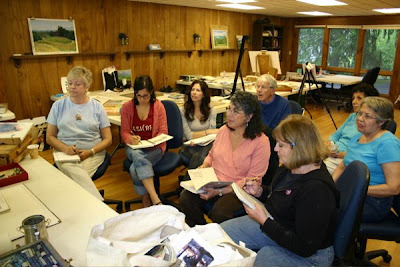 Alvaro Castagnet was back at the Hudson River Valley Art Workshops teaching the Mastery of Tonal Values. When a student asked if the color red was his “signature”, he replied No, I just like the color red. Red is the color of passion and you must have passion about your art! 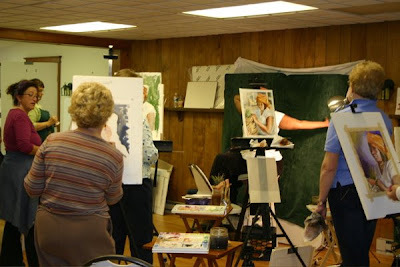 There is always a passionate group of painters here during Alvaro’s workshops. These photos were taken while the group was in one of our nearby Hudson river towns, Athens. 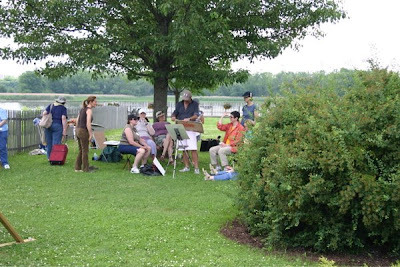 Athens is just 20 minutes away from the inn and has a nice little park right on the river’s edge, with a view of the Athens’ lighthouse. The week passed too quickly! It was over before I realized I hadn’t taken enough photos. So if anyone in the workshop took some nice shots, I’d love to included them on this blog. Just send them my way. 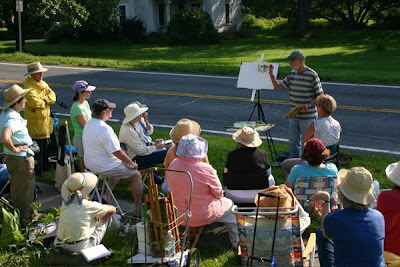 For those who missed this great workshop, Alvaro will be back again in 2010. The dates will be May 2 – 8, 2010. So mark your calendars now. 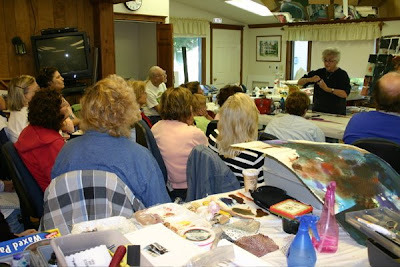 I’ll be posting pictures from this lively class in a couple of days. 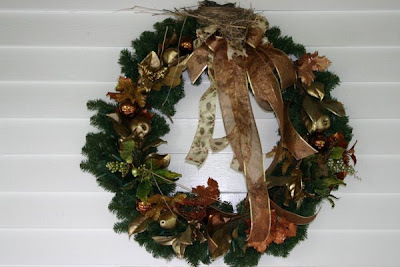 We had another nest of robins on the front porch in the holiday wreath that I was late to take down! Just as I was going to remove it and replace with a different seasonal wreath, I noticed the robin’s nest. There were three babies and they have all left the nest at this point. But I see them hopping around on the lawn outside my office window, with the mom still bringing them tidbits to eat. I guess I now have no excuse for leaving the wreath still hanging! 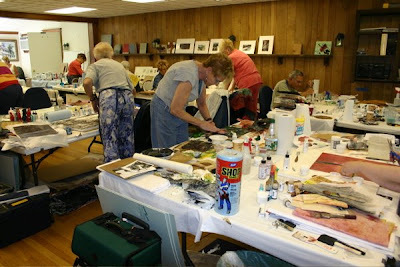 David Daniel’s workshop just checked-out this morning and it is sad to see such a happy group go. Regrettably, I only got one photo of the group because I was up to my eyeballs with work! The minute I stepped into the studio to take this picture of Dave presenting a demo, I saw a car arrive so I had to go see what they wanted. Everyone was so pleased with David that they all tried to twist my arm to sign up David to come back every year! Sorry, folks, but the 2009 schedule is already full, but don’t despair, David will be back in 2010 — same time, same place! The dates will be June 13 – 19, 2010 and we can’t wait. I had to fill in as Chef twice during this workshop while Mark was away having fun with his martial arts. I do like to be a creative cook, so I got to try out several new recipes, as well the tried and true Herb and Cheese Stuffed Chicken Thighs and Chocolate Cinnamon Cake. The Blueberry Strudel Bars with Lemon-Cream Filling were a big hit. Diane asked when we were going to open a pastry shop! I also made some Parmesan and Pine Nut Focaccia and Sweet Corn Cakes with Southwest Sauce and Tomato Salsa. Tomorrow Alvaro Castagnet arrives to teach the mastery of tonal values. Should be a fun class as always. 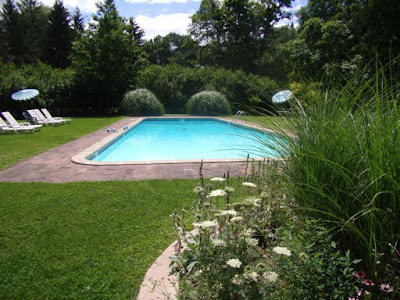 The weather looks good and the pool is ready for more poolside critiques. 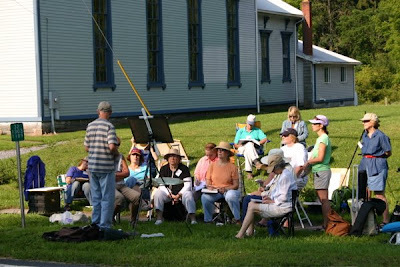 Once again a group of intrepid students came to Greenville and had a wonderful time in a workshop taught by David Dunlop. 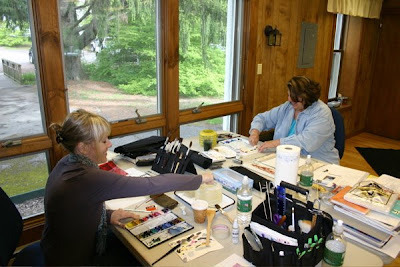 The weather cooperated for the most part, but when the rains threatened there was still plenty to learn while in the studio. 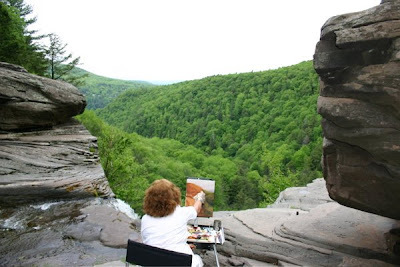 On one day the group went to Katerskill Falls, the preferred site of many of the Hudson River School artists. It was a gorgeous day. These trees are along the path down to the top of the falls. I just loved the color and contrast of the bark and the dark patches among the fresh Spring green leaves. 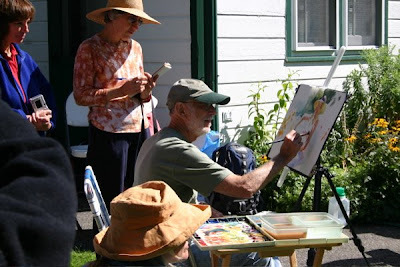 Here are a couple of artists at the top of the incline down to the falls. This shot was taken facing away from the falls. Everyone was careful to stay well away from the edge of the falls! 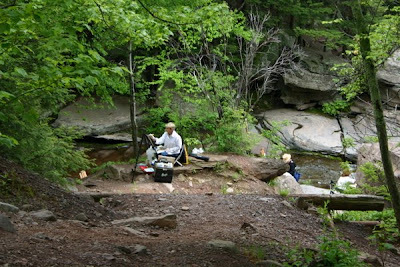 This photo faces top of the falls, but you can’t see it because Patricia has set up in a premo spot to capture the vista. Here’s David giving a little demo. 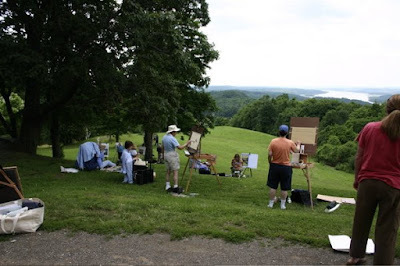 The group also went to Olana on another perfect day, but I forgot my camera! 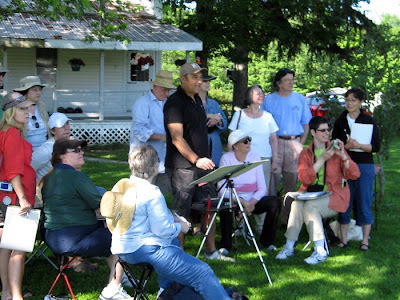 On the last day the group went to the Hollyhock Audubon Society Preserve. No hollyhocks yet, but plenty of beautiful sights. Here is Rochele deep in the greenery. 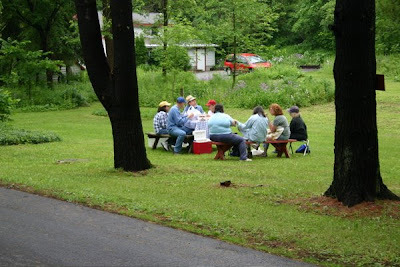 The preserve has some convenient picnic tables for the delivered lunch. 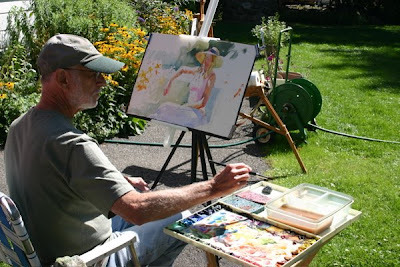 Here is Bill K. He certainly knows how to get into his painting. Winnie said that the water was rising but Bill was determined to stay on his rock until he was finished. 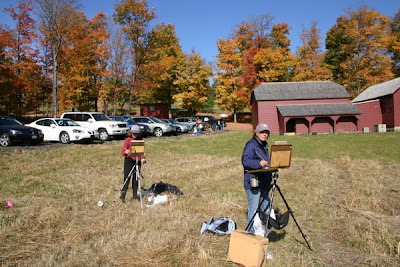 Elizabeth Apgar-Smith (aka – Betsy) came here once again to teach her outdoor pastel workshop. 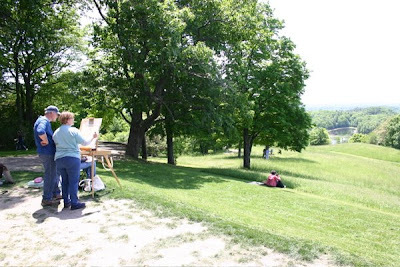 The weather was fairly cooperative and the group enjoyed a beautiful day up at Olana. 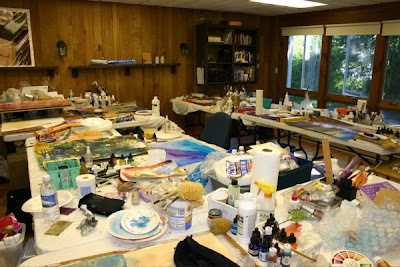 When the weather was a little more iffy, the studio was well lighted and close to the unlimited coffee and tea in the dining rooms! 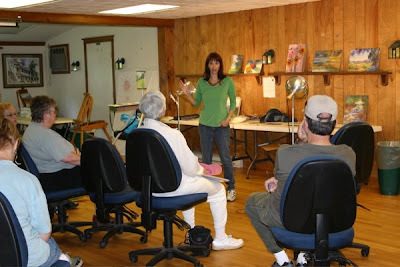 Here is Betsy presenting a demo to the group in the studio. 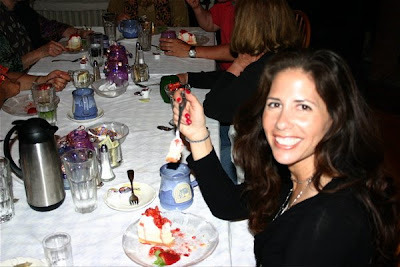 The cheesecake dessert on one evening was certainly one of the favorites as evidenced by the smile on Elyse Z’s face! 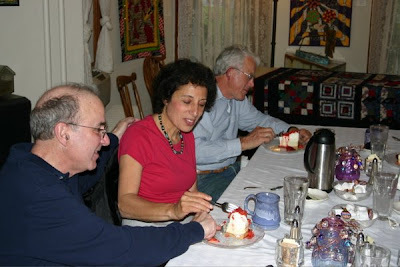 Barbara G enjoyed sharing some cheesecake with her husband, Ron, who came along with Barbara to enjoy the other attractions in the Greenville area. 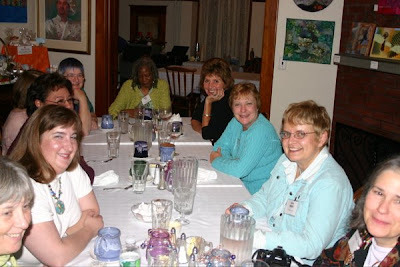 Here are some shots of the group when they were at Olana. 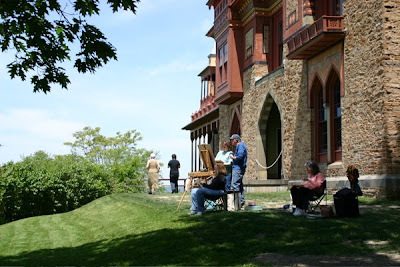 The tour of the main house at Olana is open once again after last years restorations. I’m told that the house is magnificent and the tour definitely worth it. It is wonderful to see the exterior of the house without scaffolding around parts of it! 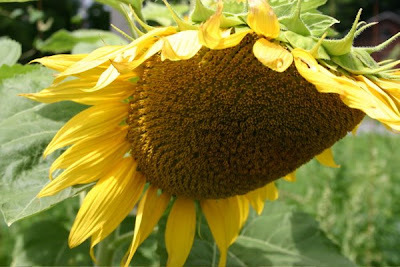 We are going through a bit of a hot spell at the moment, but the weather is suppose to start cooling off tomorrow. 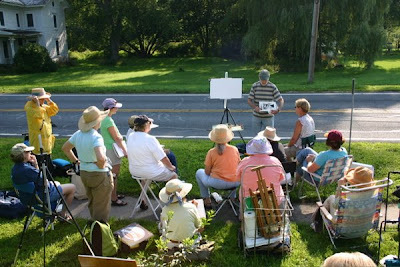 But our studio is well air conditioned and there is still a couple spots left in the David Daniels studio watercolor workshop next week. 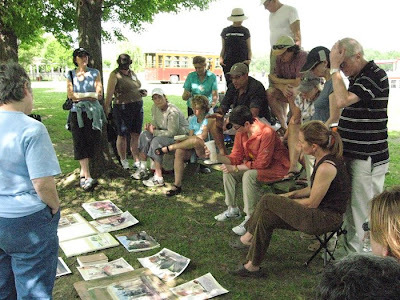 Alvaro Castagnet has a couple of Day Student spots still available in his outdoor watercolor workshop, too. We have the ice tea ready and the pool is calling, so come on over! 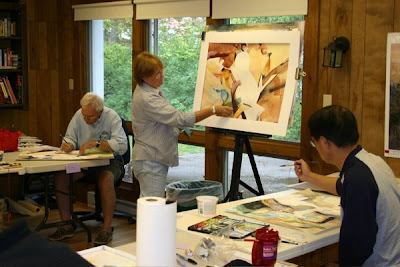 A group of eager students thoroughly enjoyed this studio watercolor workshop with Jim McFarlane. 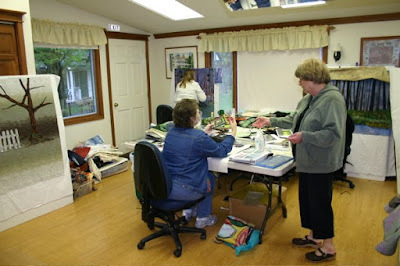 Here are Lorraine and Karen, a couple of frequent visitors to the workshops who we always look forward to their return. 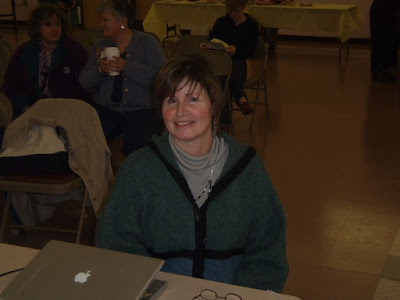 Lorraine’s early enrollments for this years workshop entered her in our early bird prize drawing and she won . . . First Prize! She will get free tuition for her enrollment in the David Daniels workshop coming up this month. Way to go, Lorraine! 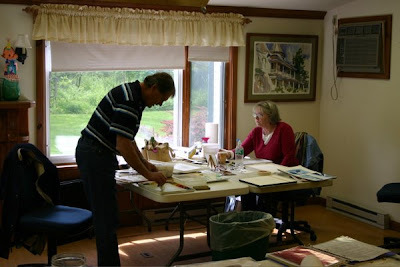 A couple more people working in the studio. 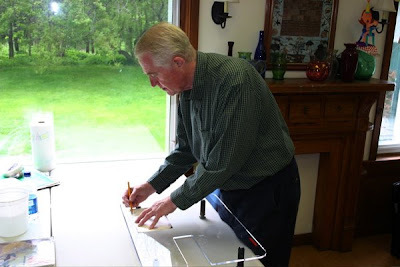 Here is Jim using one of our sewing machine tables as a light box! If you want to use a real light box, we now have a 18″ x 24″ light box available for use in the studio. Around the inn Spring has sprung and the robins are nesting. 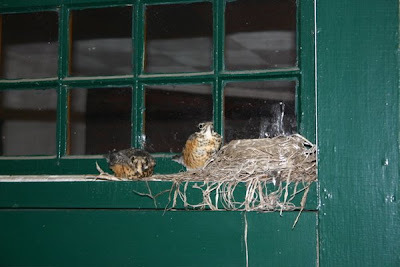 This nest is right above the back door to the Main Inn and even though the screen door continually banged shut after each person who came through, Ms Robin was able to raise these two lovely babies. I snapped this shot right before they flew the coop and went off on their own. 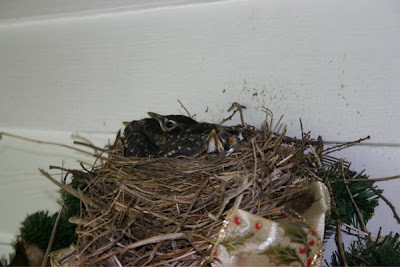 We now have another nest on the wreath on the front porch. In just the one week I was away from the Arms, the trees fully leafed out and everything has become so GREEN in Greenville. The weather is perfect and the flowers are starting to bloom. Now I can try to catch up on all of the workshop pictures. 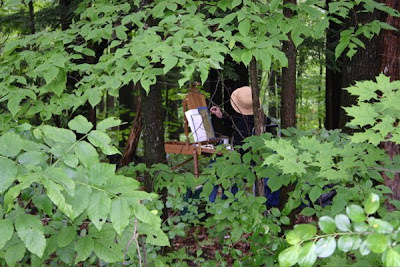 We had the pleasure of having workshops taught by Ann Fahl, Eric Weigardt, and Jim McFarlane in the past month. 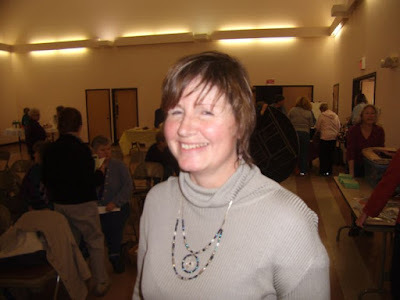 First let’s talk about Ann Fahl. 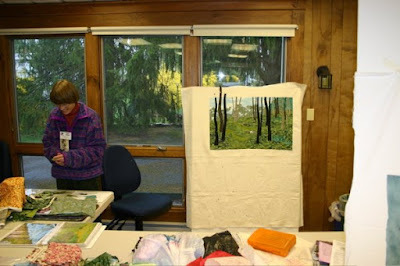 Ann taught a workshop called “Quilts from the Garden” in which she showed everyone how to interpret a photograph of their favorite flower or flowers into a design that could be created in fabric. 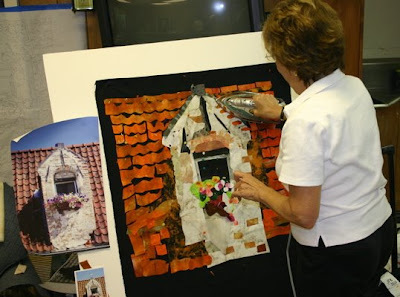 The compositions were fused on a pieced background and then Ann explained techniques for free-motion stitching using various specialty threads. Ann had such enthusiasm and charm. It was too bad she was here for only 3 days. I unfortunately did not get any photos of the workshop itself (I was too busy in the office with chocolate orders) but I did get some great shots of everyone enjoying conversations around the dining room tables. 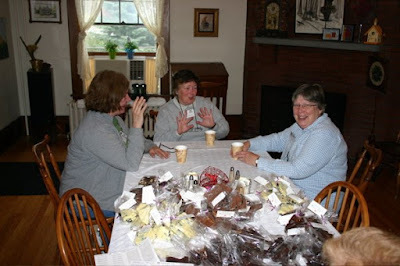 You can see that chocolate is sort of invading the dining rooms! 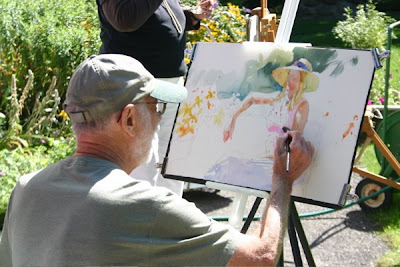 Right after Ann’s workshop came Eric Weigardt, a wonderful watercolorist from Washington State. 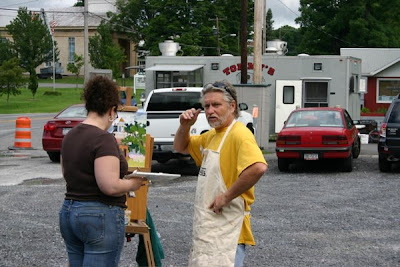 Here is Eric doing a demo in the inn driveway. I think he likes to stop traffic. 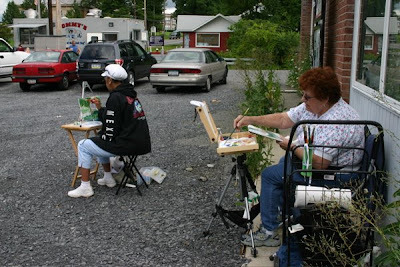 On another day the group took over a corner of our neighbor’s business parking lot — of which they were later shooed away from! Everyone thoroughly enjoyed the workshop. We can’t wait until Eric returns in 2010. 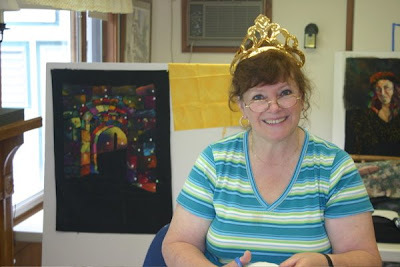 Kim is having a fun time at the Nancy Crow workshop. 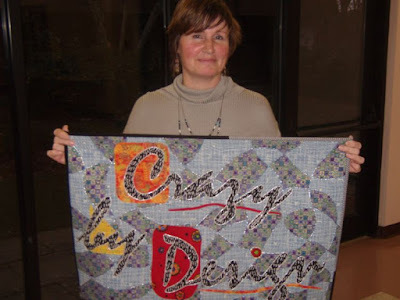 To read about her exploits, see her Crazy by Design blog.